Formex GK-17 0.45mm A3 (297 x 420mm) BLACK - £3.64 : Presspahn Ltd, Insulation for all! FORMEX and FORMEX GK are flame retardant grades of polypropylene, extruded into sheet and primarily used for their electrical insulation properties. These materials meet the insulation requirements from most application due to their high dielectric strength (1460 V/mil @ 17 mil thick), low moisture absorption (<0.1%) and UL 94-V-0 flame class rating. 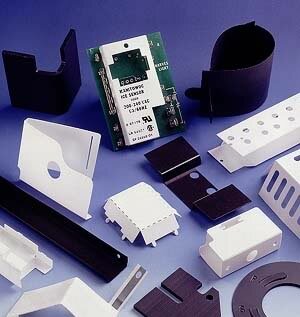 Polypropylene provides exceptional scoring and bending characteristics resulting in superior folded parts. WHY SHOULD YOU SPECIFY FORMEX? Formex, the high performance insulating barrier, absorbs less moisture than other barrier materials resulting in superior performance. Dielectric strength of > 1700V/mil at (18 mil).